In an issue devoted to education and technology, The New York Times Magazine features as its cover story an innovative New York City public school developed by Katie Salen, professor of media design in the School of Art, Media and Technology at Parsons. The school, Quest to Learn, is centered on games-based learning for grades 6-12. For the past several years, Salen has engaged students and research fellows from the School of Art, Media and Technology at Parsons in the development of its curriculum through SMALLab (Situated Multimedia Art Learning Lab), a mixed-reality learning environment showcased on the cover of the magazine. Parsons was recently named a co-grantee on a $2.6 million Gates Foundation grant focused on innovative approaches to game-based learning. Led by Salen, the project is a partnership with the non-profit Institute of Play, the Digital Youth Network, schools and after-school programs in New York City, Chicago, and Pittsburgh. The School of Art, Media and Technology at Parsons has become a nationally recognized leader in research related to games and learning. This grant will support faculty and graduate students in continuing that work. 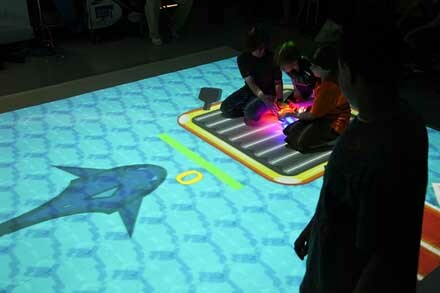 Learn more about SMALLab and other projects of The New School’s Center for Transformative Media.